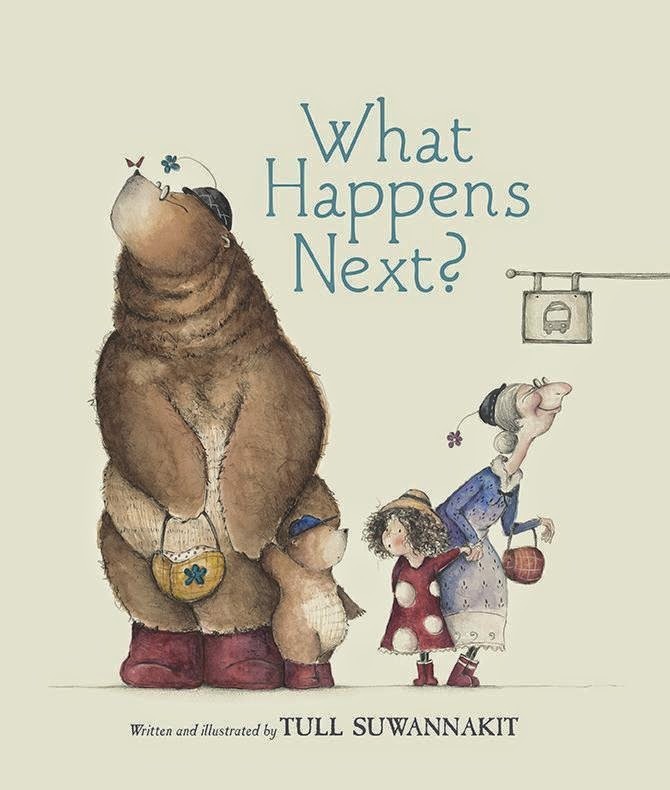 Kids' Book Review: Review: What Happens Next? Granny and Little Ellie are on their way to town, dressed in their hats and red gumboots. Little Ellie asks Granny for a story, and so Granny obliges, launching into a tale of Grandma Bear and Little Bear, who coincidentally also wear hats and red gumboots. 'So what happens next?' asks Little Ellie. The bears catch a bus, continues Granny, as she and Little Ellie get on the bus. And with wide eyes and a big smile, Little Ellie looks behind her and sees Grandma Bear and Little Bear just a couple of rows behind them. 'What happens next?' she asks. And so this delightful story continues as Granny and Little Ellie — and the bears — ride on a merry-go-round, visit a lolly shop and play hide-and-seek. But then Granny opens her eyes after counting to ten and sees the bears standing right in front of her! It seems it's not just Little Ellie who's seeing them now. She screams in fright, but then Little Ellie reminds her that these are no ordinary bears but ones who wear hats and red gumboots. 'So what happens next?' asks Granny … And now it's Little Ellie's turn to take up the story. The watercolour illustrations are exquisite, adding glorious humour and fun to this gorgeous story. As we all know, good stories have the power to transport us to places far away, full of imagination and magic — just as the bears do for Little Ellie, and this book did for me. A wonderful partnership of words and pictures that is sure to be enjoyed again and again.